This volume contains most of the invited papers presented at the International Work- shop on Synergetics, Schloss E1mau, Bavaria, May 2 to.May 7, 1977. This workshop fol- lowed an International Symposium on SynergetiGS at Schloss E1mau, 1972, and an Inter- national SUl11l1erschoo1 at Erice, Sicily, 1974. 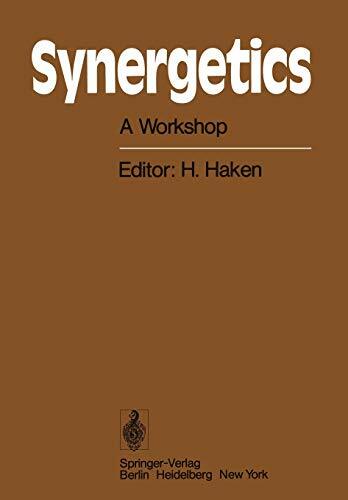 Synergetics is a rather new field of interdisciplinary research which studies the self-organized behavior of systems leading to the formation of structures and func- tionings. Indeed the whole universe seems to be organized, with pronounced structures starting from spiral galaxies down to living cells. Furthermore, very many of the most interesting phenomena occur in systems which are far from thermal equilibrium. Synergetics in its present form focusses its attention on those phenomena where dra- matic changes occur on a macroscopic scale. Here indeed Synergetics was able to re- veal profound analogies between systems in different disciplines ranging from physics to sociology. This volume contains contributions from various fields but the reader will easily discover their cOl11J1on goal. Not only in the natural sciences but also in ecology, sociology, and economy, man is confronted with the problems of complex sys- tems. The principles and analogies unearthed by Synergetics will certainly be very he1pfu~ to cope with such difficult problems. I use this opportunity to thank the Vo1kswagenwerk Foundation for its support of the project Synergetics and in particular for sponsoring the International Workshop on Synergetics.